The spaces people have the choice to inhabit are, I’m discovering, often the most interesting when it comes to innovative design. But there’s so much to choose from! It’s relatively easy to find popular libraries and see how they’re laid out. What I’ve been investigating lately are the places where people choose to work. Fortunately, because locations are rated, tagged, and reviewed on Google Maps (via Google Plus), I’m able to see which locations are considered the best places for studying and working. Which brought me to two places: the first is Tinderbox. 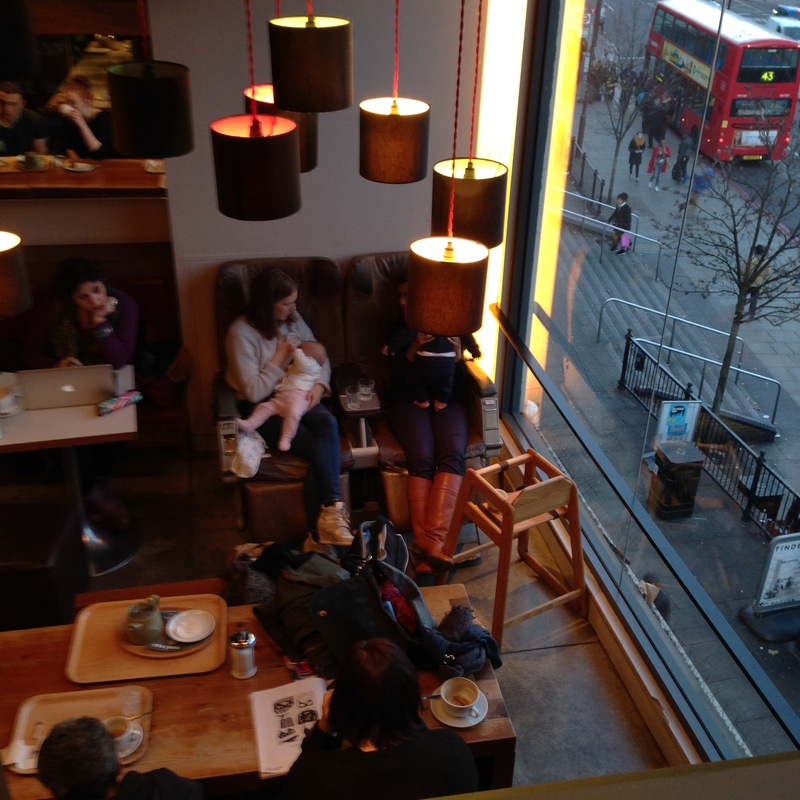 Tinderbox is a coffee shop in Angel, Islington. Based on the reviews and the photos online, I really thought this place would be bigger than it is. But I think that’s part of its charm. From this view, mostly what you see is the typical split between the common table and smaller tables for two. But there are a few more really unique and interesting spaces in this place. There’s something about a cozy space. I met a student here who told me they call Tinderbox the Nook Café, because of all the interesting little spaces in it. Given that it’s a warehouse conversion, that’s quite a feat. All the nooks in it are entirely retrofitted from an open space. I’ve seen several takes on the low-head-height approach, mostly with furniture. Psychology isn’t my area, but the idea that we tend to find smaller spaces comforting and comfortable resonates with me. A friend of mine (Lucas Barber, Project Manager at UTM Library and all-round good guy) once told me that his father, who builds houses for a living, always builds small bedrooms with attached sitting/dressing rooms rather than gigantic master suites. He says we don’t tend to sleep well in big, open rooms. That idea has always stuck with me; small, cozy rooms feel safe and comforable, even when we think bigger is better. I’ve noted this as a bit of a trend in the most popular studying spaces, too. Ensconced up in the rafters, facing outwards, looking down, with a lower head height; spaces like that seems private, safe, comfortable, and quiet. Does it help students to concentrate? To feel comfortable? At home? The people inside these booths definitely seemed to be in rooms of their own without being entirely cut off from the larger group. Maybe that’s part of the appeal; alone in a crowd, off to one side, sheltered. Alone together. 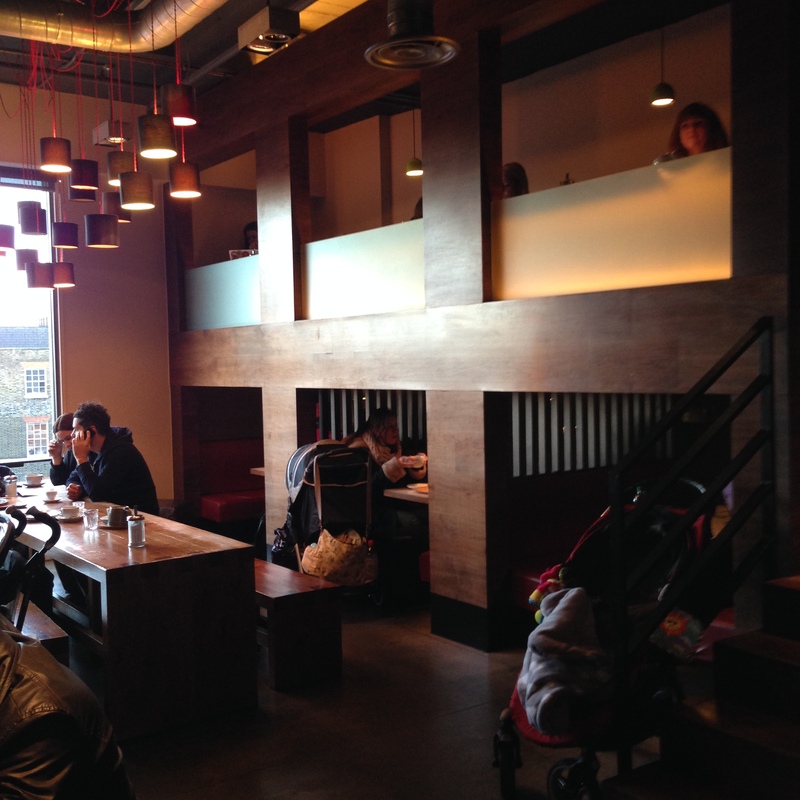 The second (of several) interesting spaces at Tinderbox is the mezzanine level above the booths. The low buzz of the café crowd below, a view and streetscape, low ambient lighting but good direct light on the table in front of you, power for your computer, and coffee. This space genuinely couldn’t be better designed for the student crowd. 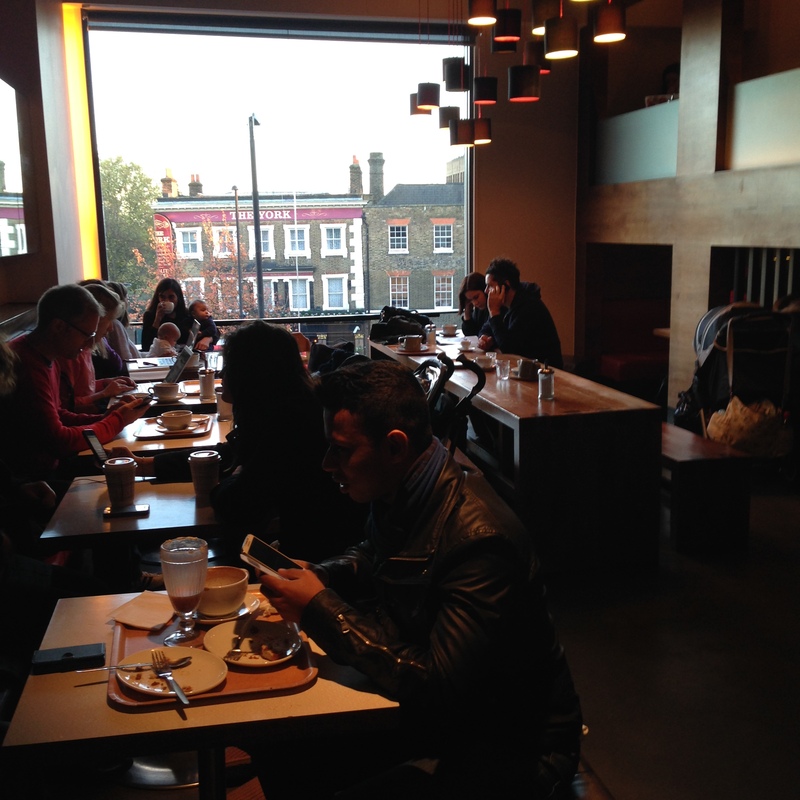 Tinderbox also has free wifi, so it doesn’t take much to see why this place is so well-loved and well lived-in. The view from the mezzanine, and the third interesting space: a set of old, worn, ratty airplane seats. I found this area really interesting, because it breaks the rules for creating seating for two. Generally you arrange to have people face each other. But the two new mothers sitting in these seats were quite comfortably and happily having a chat the entire time I was here. For all the self-conscious “conversation areas” I’ve seen in libraries and elsewhere, this might be one of the most successful. 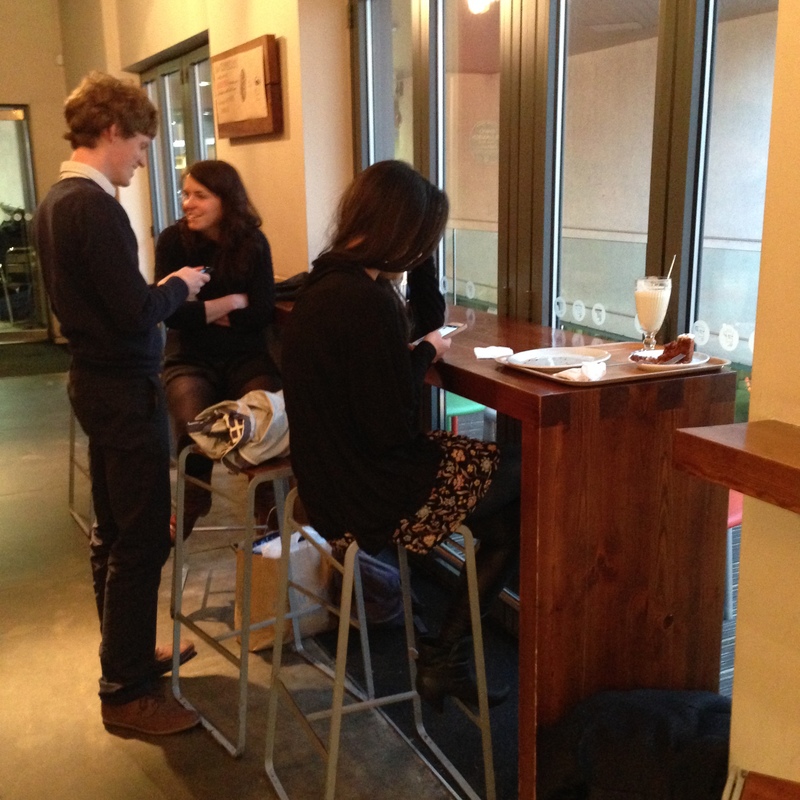 It’s quirky, interesting, and completely conductive to long conversations, particularly placed as it is by the window. It’s interesting that they didn’t try to put seating right up against that terrific windnow, but I guess this way the whole space shares it uninterrupted. I genuinely don’t know what they thought was going to happen here, but I’m fascinated. I’m not sure why you would put a cushion down on a place where, if you tried to lean back, you’d end up with a wooden corner digging into your spine. But I like the built-in table and the sheer uniqueness of this thing. It’s the opposite of the booths; wide open and tiered, visible to everyone walking in, perched above the crowd. I’ve seen steps in use as seating areas all over the place, so I can see the appeal of adding them as deliberate seating. And in front of the cash and the pastry case, traditional bar seating, facing a small patio area. No power that I saw, just a simple wooden ledge-table and stools. Interestingly, as with many spaces like this, patrons feel free to strike up conversations, often with one person standing and another sitting. Personally, I really like seating like this in areas where patrons frequently need help and input from staff, because of the ease with which a standing person can interact with a seated patron. It looks and feels natural. I think, as far as cafés go, the variety of spaces contained within Tinderbox is closer to a library than any I’ve ever seen. But its touches are more homey and quirky than libraries tend to be. It’s small, cozy, warm (lots of wood filling up what is essentially an industrial space), with low ambient lighting but good task lighting. Librarians tend to design things in orderly lines, with bright spaces we can easily peer into to ensure that the right kinds of activity are going on. We design spaces that are less quirky and more efficient. I understand why students choose to work at Tinderbox; it covers all the bases. It’s homey and comfortable without being a junky living room. 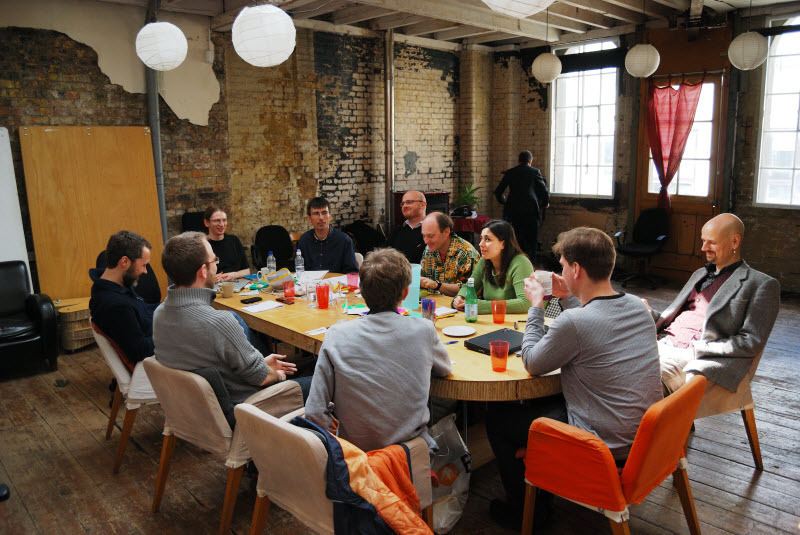 It’s an interesting mix of shared spaces, any of which can turn into collaborative ones. 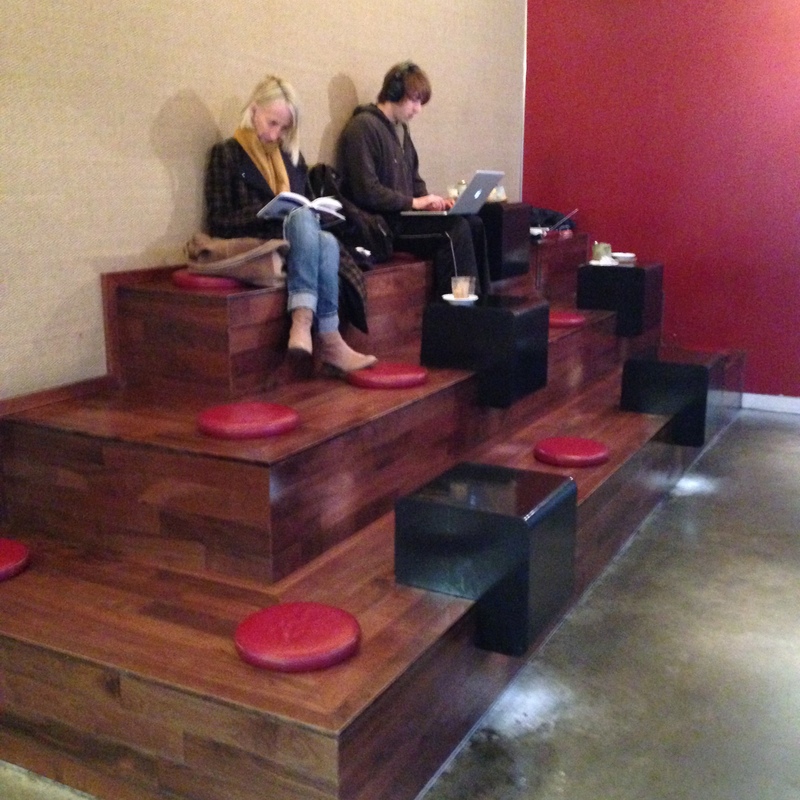 Another place I got a look at today is a co-working space down the street from Tinderbox called The Hub Islington. I didn’t take this picture. I was there, but I didn’t want to bother the full house working there at the time, so I’ve borrowed this one. The Hub is a co-working space on the top floor of an old warehouse in Angel. It’s designed by and for freelancers who want an office to go to rather than sitting at home all the time. They apply and pay a fee to work here. 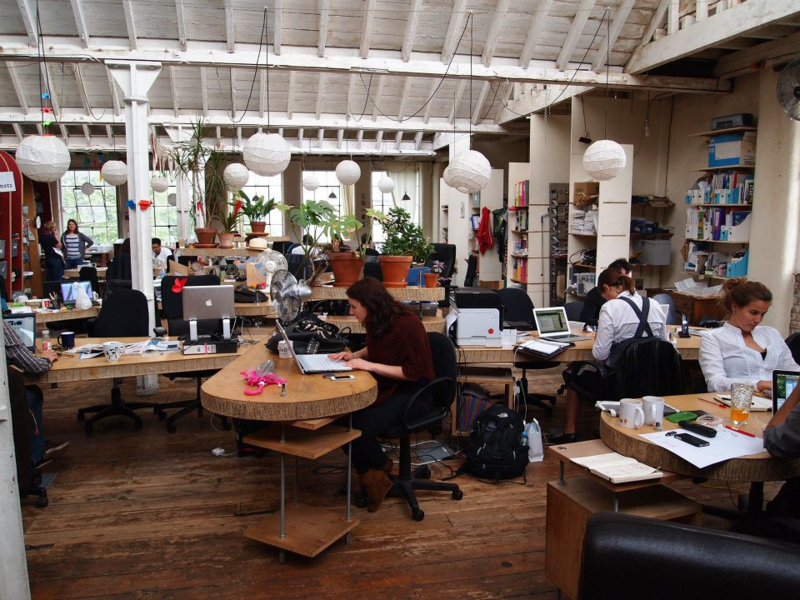 If we want to learn anything about deliberate choices of the best working spaces, co-working collectives might be the best place to turn. Not only because the people who use them tend to be innovative and design-oriented, but also because these are road-tested, and people vote not only with their feet, but with their membership fees. The Hub Islington co-workers hotdesk. 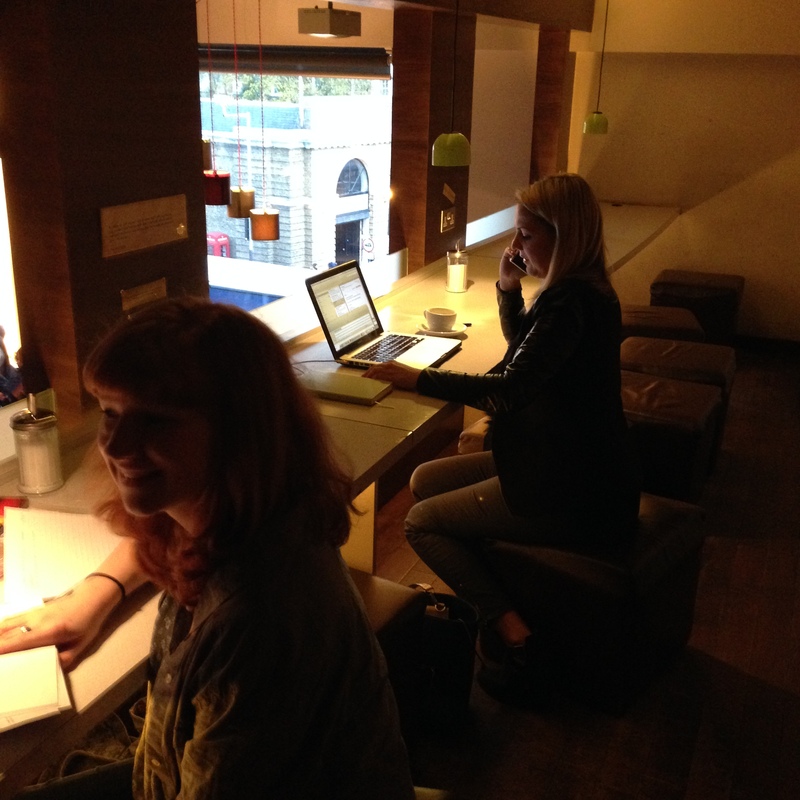 Hotdesking means that no one has a permanent desk; you choose the kind of spot you need when you need it and set up there. Therefore the Hub includes a variety of different kinds of spaces for the co-workers to shift between. The petal-like desks and chairs on casters allow each person to set up laptops as they like and need. Without monitors on the desks, they can pick how much open desk space they want at any give time. It also means they can deliberately work with someone else close by, or more independently. I like the way they have connected pieces as well as independent pieces; it makes “zones” out of thin air, and stops the place from being a hive of cubicles. The Hub Islington includes a “library” (a nook in the left corner, by the windows, with two walls covered in books and cushioned benches. Because the library is a bit obscured, I think this space might fill the gap for those who want to work in a public place with a bit more privacy. Maybe for intensive thinking, or other kinds of private, quiet time. The Hub also includes a kitchen, and a dining booth area, presumably for having lunch as well as for impromptu brainstorming. As you can see, you sort of clamber into it, with your feet dangling. 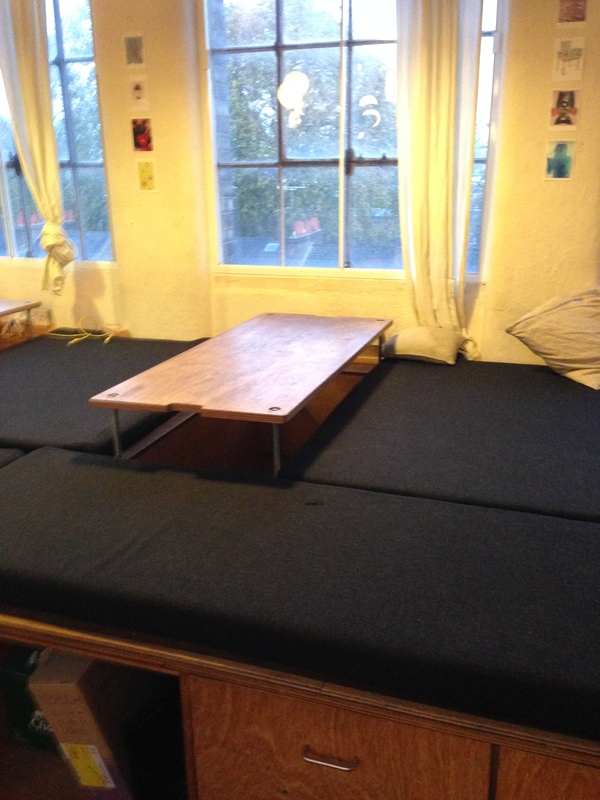 Or you can cozy up alongside the table, feet out, with cushions against the wall, and get some work done on a laptop. There’s a running thread in these chosen spaces of “home” metaphors. But it’s not like taking someone’s house and making it a public space; it’s not like an Ikea show room. It’s home with a significant professional twist. In fact, I’m starting to think that “home” isn’t the right metaphor, given how far afield these spaces get. People generally don’t have spaces like this in their home. The idea of a couch, a kitchen table, the ability to shift from one kind of space to another, that’s some of the home-ness of it. But the layout and structure itself is far from “living room” or “dining room”. The idea of “home” imparts the idea of different kinds of comfortable space, but it’s more formal than home. It’s just a more thoughtful office space, really. It’s a dining room metaphor. This is a space you use when you’re deliberately in meeting mode. This space has a door on it that can be closed, unlike any other part of the space. These are two spaces that have been deliberately chosen by those doing individual work. The first was designed by business owners developing a commercial enterprise; the second, by co-workers themselves, originally drawn on the floorboards in chalk. Both are an interesting mix of comfort, connection to other people, ability to share with close collaborators or friends, and a strong thread of individual space. So these are the kinds of spaces that people chose for themselves: no individual offices, and no permanent stations, no complete privacy. There’s a connection to other people there, always, even if you’re not speaking to those people, or know them at all. They aren’t silent spaces, but they’re not excessively loud, either. They both have a buzz of work going on, in and around the casual talk. They are both flexible spaces, not because the furniture necessarily shifts around a lot, but because it supports a wide range of different kinds of activities, individual and collective, and the ethos of the space embraces the idea that different moods, tasks, or projects need different kinds of configurations, different furniture, and different affordances. In both, you’re not stuck in one kind of chair looking at one kind of view for all the work you do. You get to choose. There is a monumental shift going on in computing. It’s a technical change, a software change, and most importantly, a change in the way we think about and approach a computing device. This change has to do with what a computer is. We’re familiar with the more radical end of this change as the smart phone revolution. It used to be we had two very distinct devices: a computer (which sat on a desk, had a screen and a keyboard, and required us to bring a chair up to it so we could rest our fingers against the keys) and a phone (which could be attached to the wall, sit on a table, or, eventually, fit into our pockets, has small keys, or, increasingly, software-only keys). The rapid merging of these two devices has left us with some very confused metaphors for computing. As librarians, we’re not entirely sure anymore how to signal to a patron that we have set aside a device for their use. We set up computing so that patrons can use them, but we struggle to break free from the workstation metaphor, even when it would behoove us to do so. Not to point fingers only at the Idea Store. This is tough, a lot of people are struggling with it. This is a tough one. But this terminal is just a stand up desk, really. You can’t put your stuff down on a table, and you can get stuck in for the afternoon of checking your email and writing an essay. It’s not comfortable enough to be a workstation. It says, “You, patron, may use this computer to do simple things, like looking something up.” Patron in that case is most definitely singular. 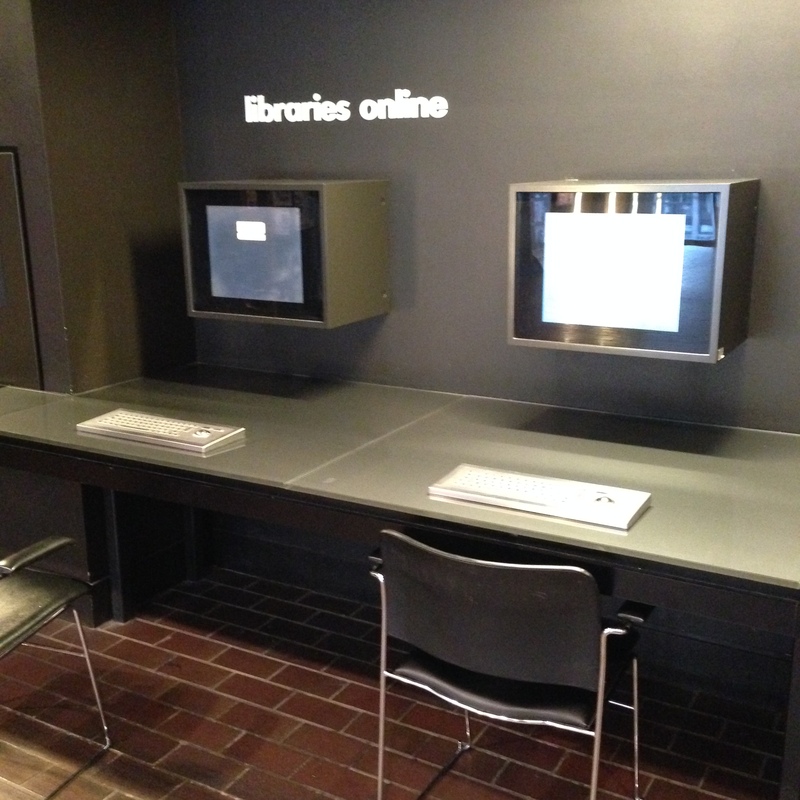 Here’s the not-especially-innovative interactive stations outside the Barbican library. Here we haven’t even moved away from the idea that you have to sit down to interact with digital media. At least they’ve got those steampunk keyboards with the included mouse to avoid all the extra wires. Rollerball for the win! Once again, the layout is telling us how many people should be using these stations; one person per. If you were to bring the second chair over to look at something with a friend, you’d be depriving someone else of the use of a machine. Without intending to, we shout out our belief that computers are single-person items. 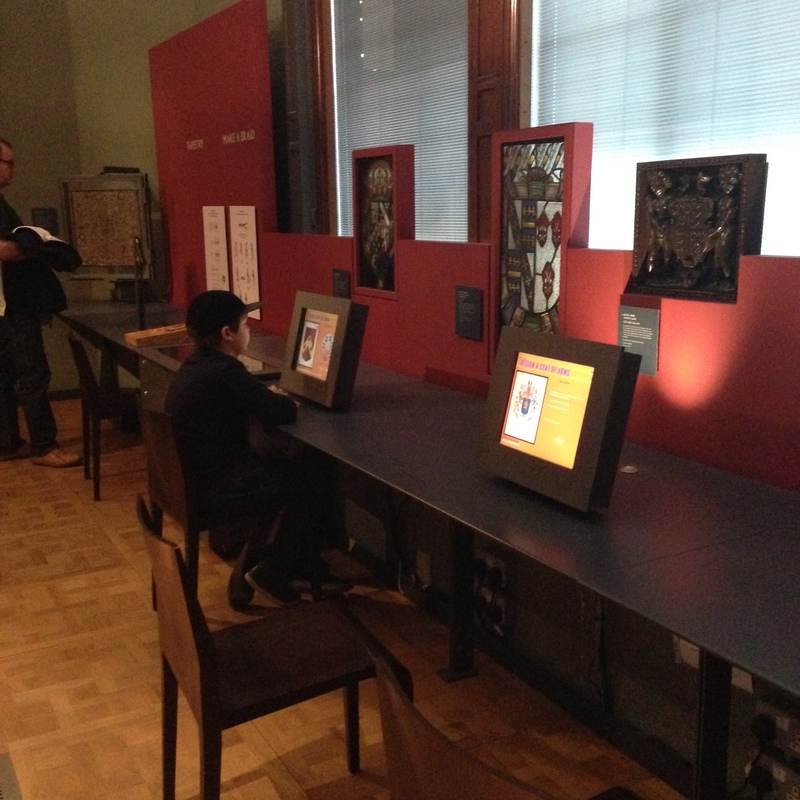 Everybody really likes the idea of bringing digital information into an experience; there’s just so much of it, and there’s no way any space, library, museum, or otherwise, can have any hope at all of bringing all or even most of it to its patrons without using screens. But very often you can see innovative spaces, like the Victoria & Albert Museum here, resorting to screens and chairs, in keeping with ye olde workstation metaphor. Is this the best way to bring digital information to patrons? It’s certainly the easiest. And the simplest for the patron to understand. And not to say that these stations aren’t interesting and thoughtful; a lot of them are. 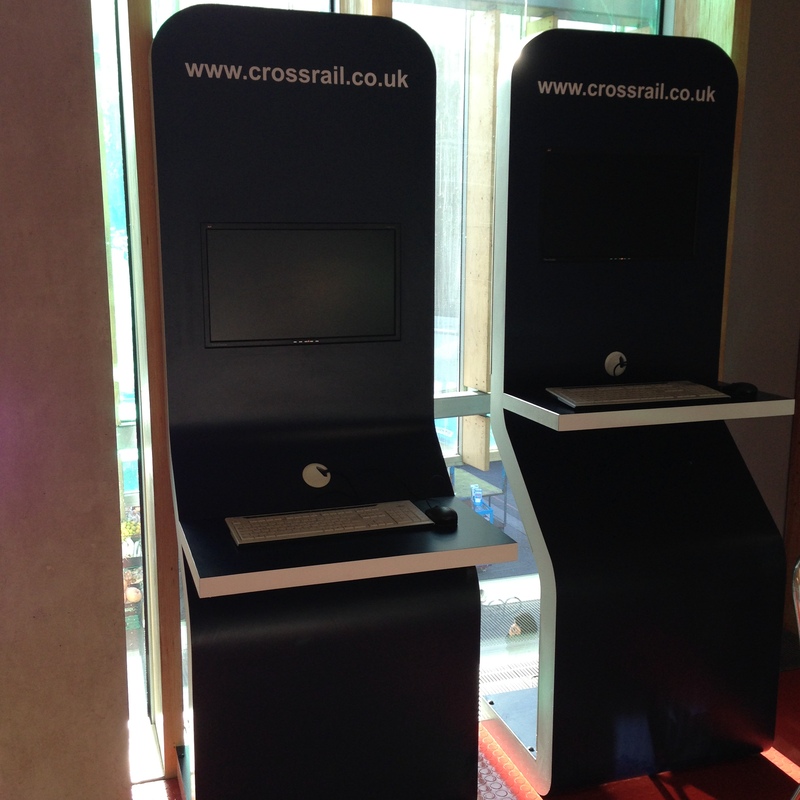 These are the Crossrail information terminals at the Idea Store Whitechapel. As profiles go, these are pretty slim. For a workstation that’s been straightened out so you can approach them while standing as use them, yeah, they’re great. But this metaphor is wearing very, very thin. One person per screen, please. We started out that way in computing, and we keep reproducing it. 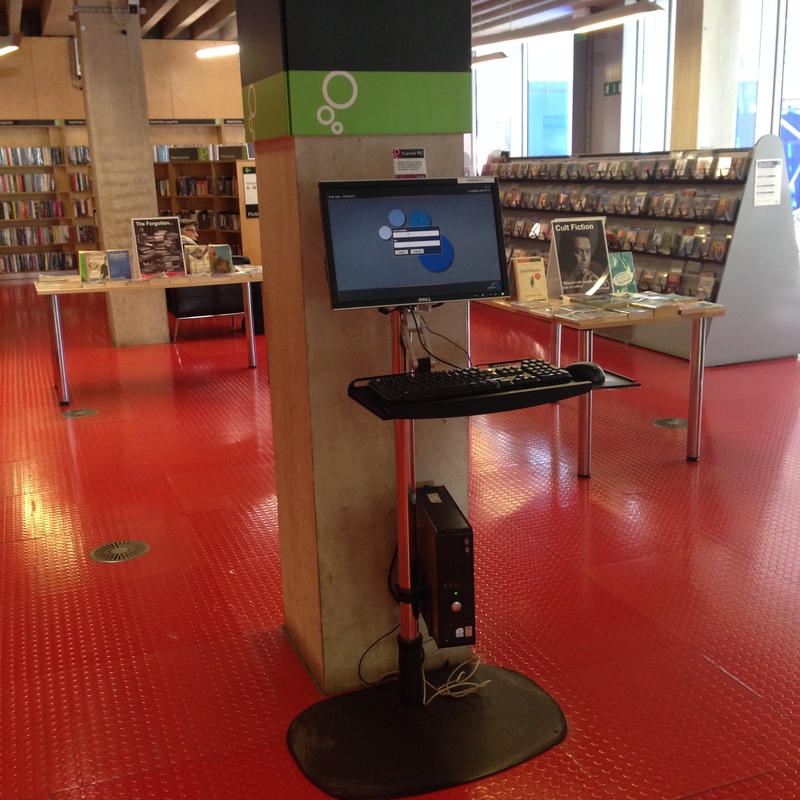 This is a really nice monitor/keyboard/rollerball mouse set up at the Central Library in Cardiff. That’s my friend Imogen; she went straight for the keyboard, because it was there, so she assumed it was required to use the machine. That’s a touch screen, though, as I showed her. (I can tell it is: of course it is! It’s high tech! This is a standing totem terminal, of course it’s a touch screen!) Because the affordances of the set up return the patron back to the workstation metaphor, all the interesting affordances of the touch screen go flying out the window. The touchscreen, which replaces the keyboard and the mouse pretty effectively, is not a new technology anymore, and a lot of libraries (and museums, and all kinds of other spaces) have them. But libraries may be the last ones holding on so strongly to the keyboard. I understand why we do it; it’s true that you have a lot more scope with a keyboard. You can short-circuit whatever the designer thought you were going to do at this terminal with a keyboard and do what you need to do. It’s flexible. It makes that terminal ready for anything, and we really like to be ready for anything. We hate restricting what a patron can do. But unfortunately that flexibility puts the device, and by extention the patron, in a very tight metaphorical box. In trying to make sure a patron can do anything they want, we often don’t use contextual and layout clues help them do the thing they’re probably there to do. Here in the National Portrait Gallery they’ve got images, objects, and digital information all threaded together. The digital information is relevant and interactive, though interactive in a very limited way. But it’s not pulled out and stripped of its context, which is key. It’s the [read more] of the museum world, attached to the exhibit without overwhelming it. The patron has navigated to this piece of information not through clicking through a web page, but by physically moving through the building. Because of the physical location of the patron, we can make all kinds of assumptions about what information they want or need. It’s those few steps before search that they’re tying into here; anticipating information needs and incorporating them into the space itself. 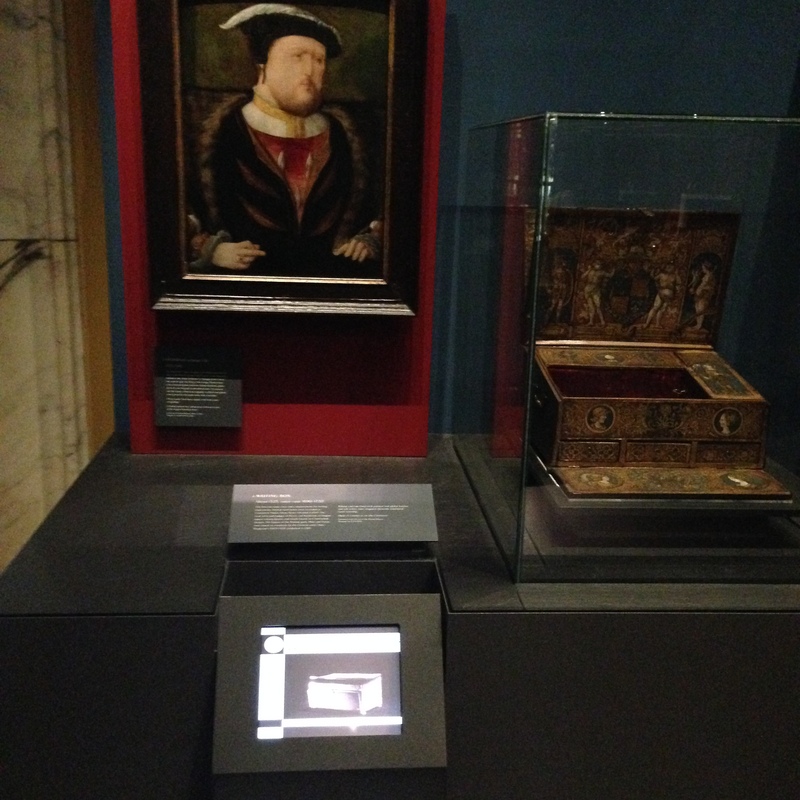 That device on the Henry VIII portrait isn’t as flexible as the terminals with keyboards above, which can do absolutely anything, but it’s more targeted, specific, and in that moment, useful. It’s not expecting the patron to do any work at all. There’s no keywords, because the patron has indicated the keywords by moving to this point of the museum. 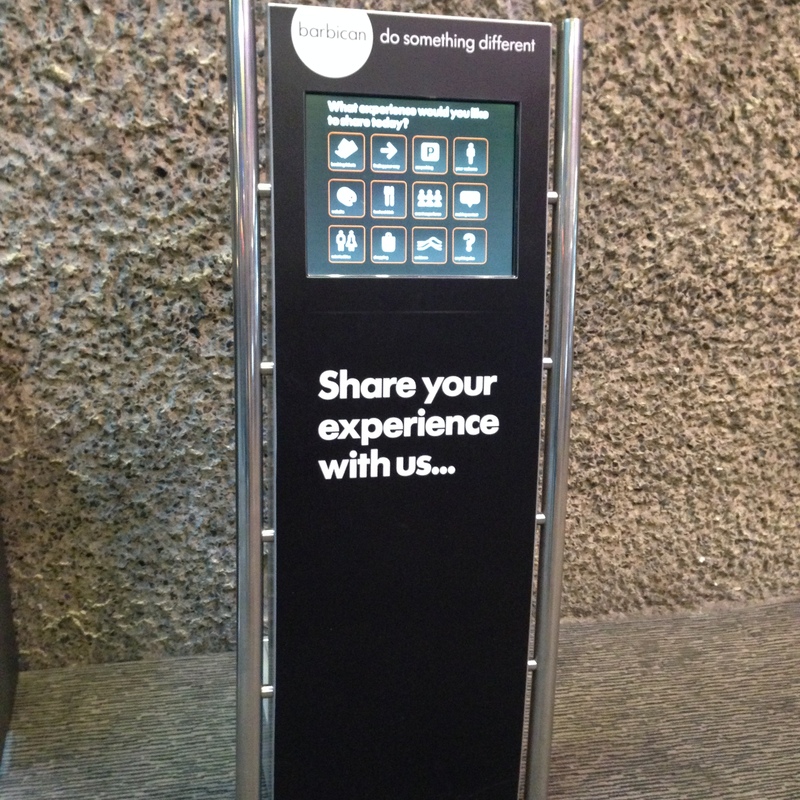 This is a fully interactive totem terminal at the Barbican, designed specifically to gather feedback from users. There’s no question that that screen is a touchscreen (obviously). No keyboard, you’ll notice. No mouse. (You don’t need a mouse with a touchscreen, because your finger is the cursor.) It’s not a computer you can hijack to check your email or jump into a search engine. It has one purpose, and it does that one purpose well. As computing has become cheaper and cheaper over the years, we’ve had more opportunities to include computing with limited purposes like this one. I think we often fail to notice that computing has become cheaper, and thus our relationship to it can now change. When a computer cost you five thousand dollars at minimum, it made sense that you wanted it to be as flexible as possible. 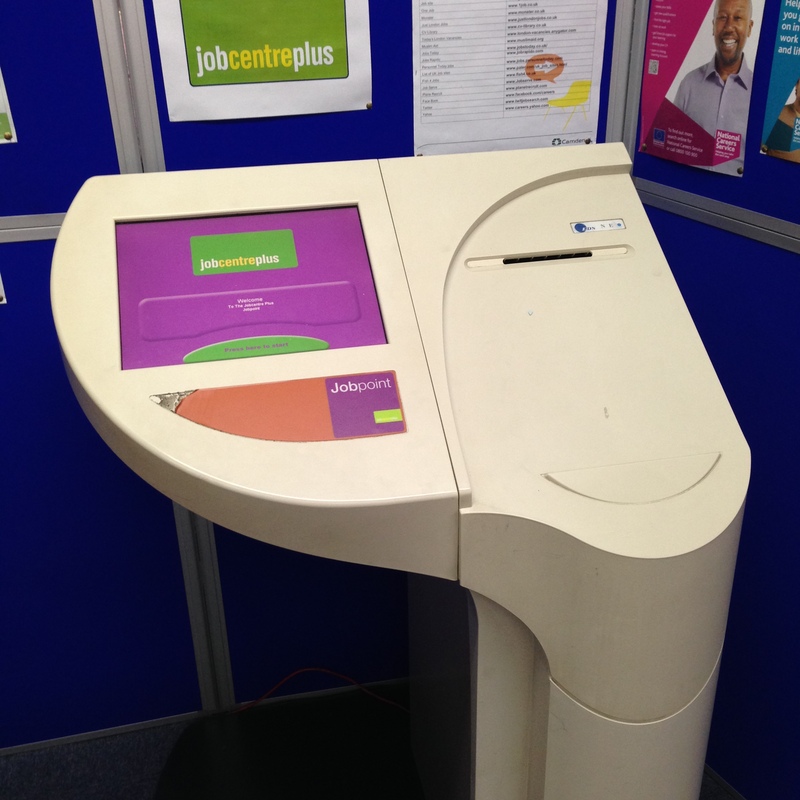 I found this Jobpoint terminal at the St. Pancras Library in Islington. It’s a small library attached to a branch of the borough council, which offers a range of services to residents, from issuing parking permits to housing benefits. The jobpoint is, as the name suggests, an interface to view job postings. Public libraries are frequently the centre of support for job seekers, but I haven’t seen such a sophisticated job searching terminal before. No keyboard, no mouse, but there is a small printer. This is a terminal that’s sensitive to its context; job seekers can print out the details they need of a job that interests them. This terminal brings the riches of one particular database to its userbase, and one which, in this case in particular, isn’t well-known for being especially computer-savvy. 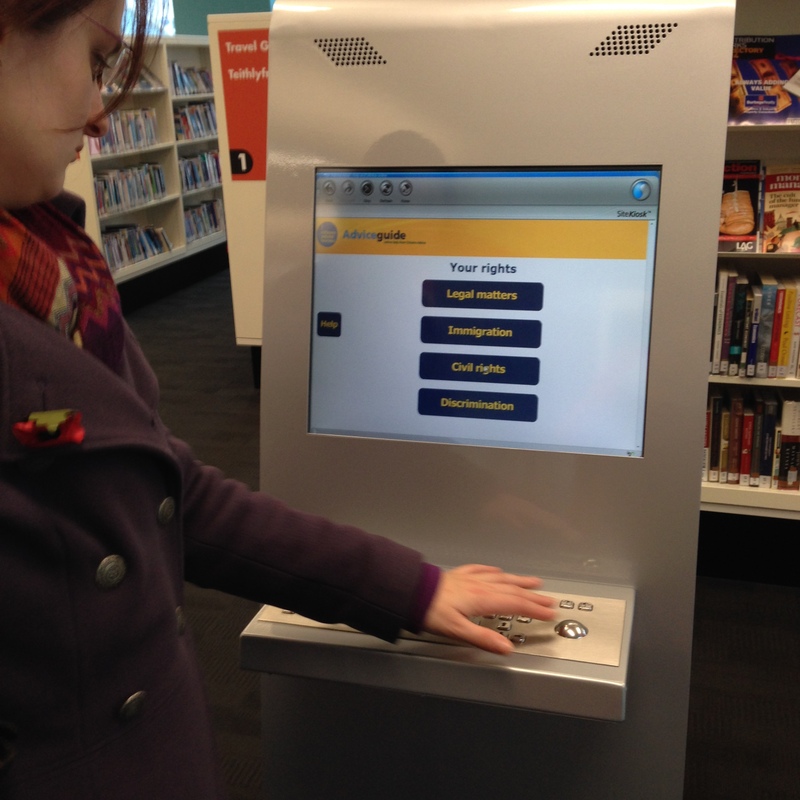 Now that I’ve seen this one, I’m surprised that catalogue terminals in libraries don’t look more like this. The needs are strikingly similar. Minus the workstation metaphors, you can see how much easier it would be to provide support to someone using a terminal like this. It’s design doesn’t tell you how many people can use it at once the way a keyboard and a mouse do. It doesn’t invoke a private, personal computer. Anyone walking up to it knows it’s not somewhere they can sit down and read a book, or work on their essay, or send some email. It’s computing, but it’s not a computer the same way catalogue terminals often are. I keep looking for the holy grails of collaborative-friendly computing spaces, and they are few and far between. I know they exist, I’ve only just started my explorations, but even seeing attempts has been helpful to framing what it is we’re doing, and how we might consider creating different kinds of spaces and interfaces. As we know, the TARDIS can be operated by a single person. 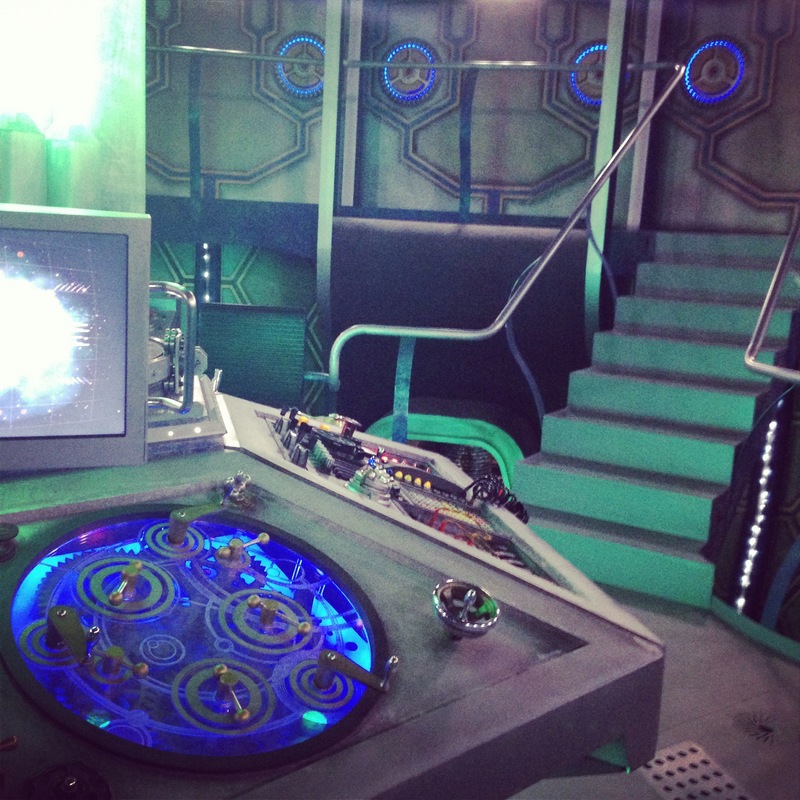 It’s a Gallifreyan workstation, as it were. But we know it works better with a crowd.